What is it about tacos?? They are the kind of thing you can eat with one hand, and you can pretty much make them with anything. They are a delicious, self-contained unit that includes all four food groups. And you know what else?? They’re really, really fun. There’s a reason many families have “do-it-yourself” taco nights–because building your taco and all the different flavour combinations make it so much fun. Protein: you can go with pretty much anything here. Traditionally, it’s cheaper cuts of meat, like ground beef or slow-roasted pork shoulder. Fish, of course, is awesome if you live on the ocean. But you can go vegetarian and vegan, quite easily with a product like Yves Veggie Ground Round, or the lentil technique I’m about to show you. Veggies: veggies add texture and crunch. Traditionally, it’s lettuce, but I like a nice cabbage-based slaw, as well. Again, pretty much anything goes, here. Cheese: smoothes everything out, gives you that creamy mouthfeel. Easy enough to sub in a vegan cheese like Daiya if you are vegan or lactose-intolerant. Condiments: salsa, hot sauce, sour cream (if you need to cool it down), you can go as spicy or as mild as you like. 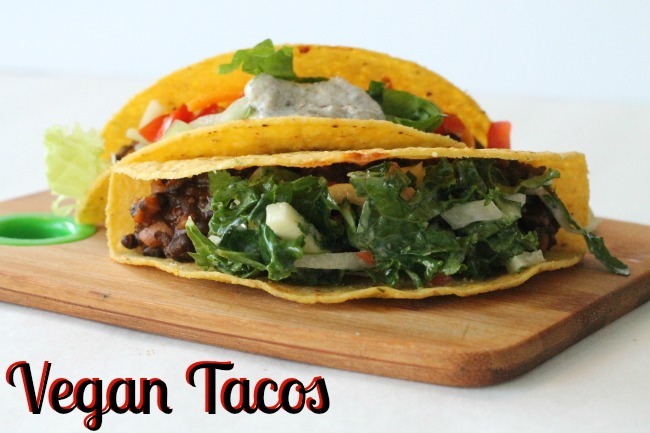 I made two different versions of these tacos; one vegetarian, and one vegan. I used the same base recipe, made from black lentils. The vegan version I topped with a crunchy kale, green apple and jicima slaw, and the vegetarian option I topped more traditionally, with cheese, lettuce, tomato and sour cream. On the left, Vegan with a kale/jicima/apple slaw, on the right, more traditional toppings, including cheese, lettuce and tomato. The great thing about this base is that you can let you imagination fly. You could create a tortilla pie (kind of like a Mexican version of lasagne) with it, or make it into enchiladas. It would also be great melted into quesadillas. Bring water (with vegetable stock cube dissolved in it) or stock to a boil in a medium-sized saucepan. Add the lentils and stir well. Bring to a simmer and cook, half-covered, for about half an hour, until tender. Drain the excess water off (if there’s any left) and reserve. In a large frying pan, heat the oil over medium heat, and then add in the onion. Stir well and allow to soften, about 3 minutes. If you are using fresh spices, and not a taco seasoning mix, now is the time to add them. Add the garlic and mushrooms, and cook until the mushrooms start to lose some of their liquid, about another 3 minutes. Add the lentils, soy sauce, and apple juice. Stir well, then add the taco seasoning, if using it. Add the apple juice and stir well. At this point, taste for seasonings, and more salt, pepper, chili or cumin if needed. I like to mash mine up a little with a potato masher or a fork so that they aren’t totally uniform. Add more water if you need to, to get the lentils to that stewy consistency. 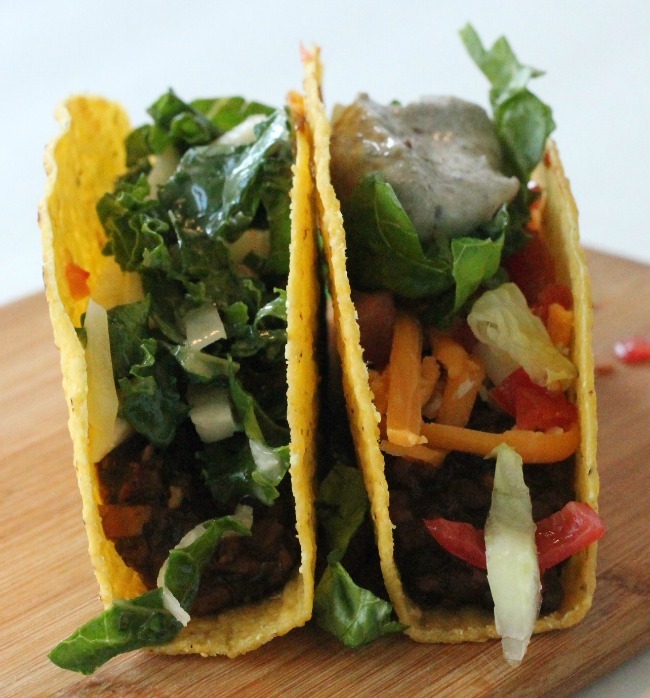 Serve with soft or hard taco shells, and your favourite toppings. Okay. So, we can have a whole debate about whether or not vegetarian folks are interested in eating food that looks like meat. We can even debate whether or not we should try to convince meat-eaters that vegetarian food is just as yum as meat by tricking them. But let’s not. I don’t have that much time. This recipe came to be because I had a birthday party a few weeks back. For it, among other things, I made my world-famous (not really, but I do have to brag that it’s gotten me a couple of marriage proposals) slow-cooker pulled pork. 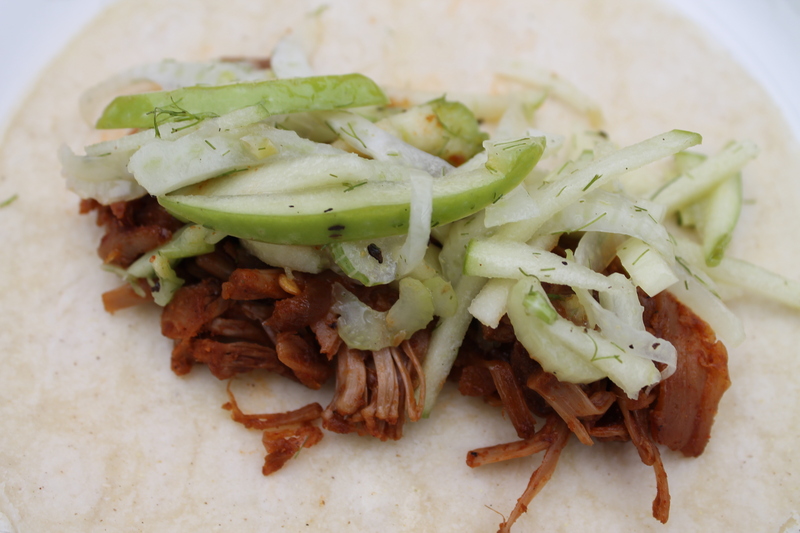 Not to discriminate against my vegan pals, I began doing internet research on vegan pulled pork, and well, here it is. This recipe is a wonder. Seriously, it looks like pulled pork. It tastes sweet and spicy and yummy. And it’s jackfruit. What the what?? 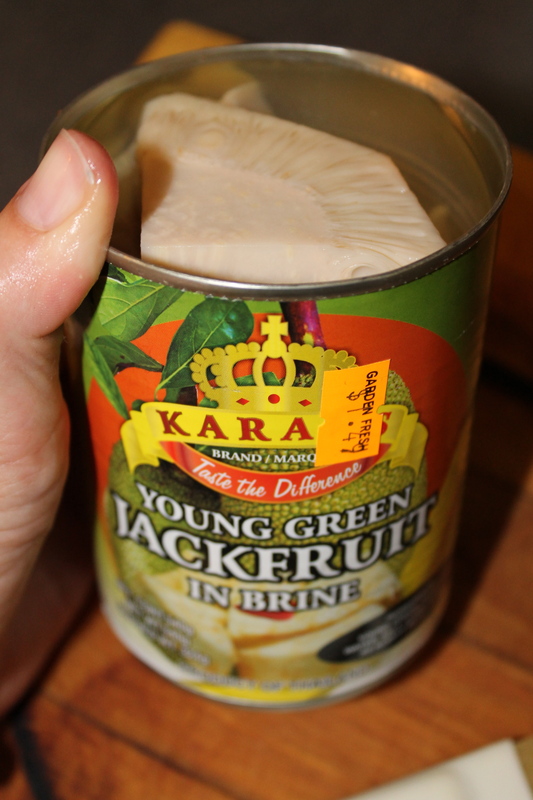 Yeah, that’s right, jackfruit. I’d never heard of it either…. Jackfruit comes from South Asia and Africa, and it is a big, big fruit. The thing that I think it most resembles is pineapple–prickly on the outside, with a tough core, surrounded by a softer, more fibrous outer layer. But you don’t have to worry about trying to find one fresh. Just buy it in cans. You should find it at your local Asian supermarket (I got mine at T & T: $1.49), and buy more than you think you’ll need, because by the time you’re done cleaning it, you’ll throw about half away. Drain the Jackfruit in a colander and rinse to get the brine off. 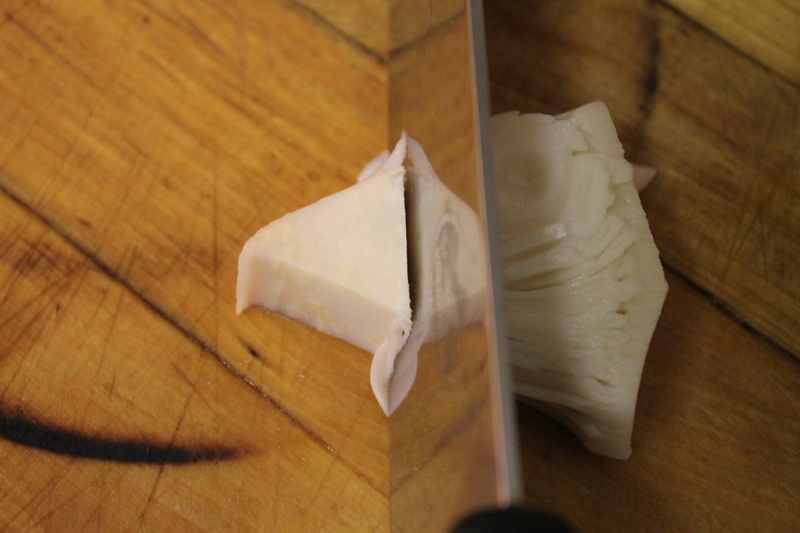 To prepare the Jackfruit, you need to cut off the tough inner core pieces, leaving just the fleshy part behind. There are also pod-like bits for seeds that I discard as well. 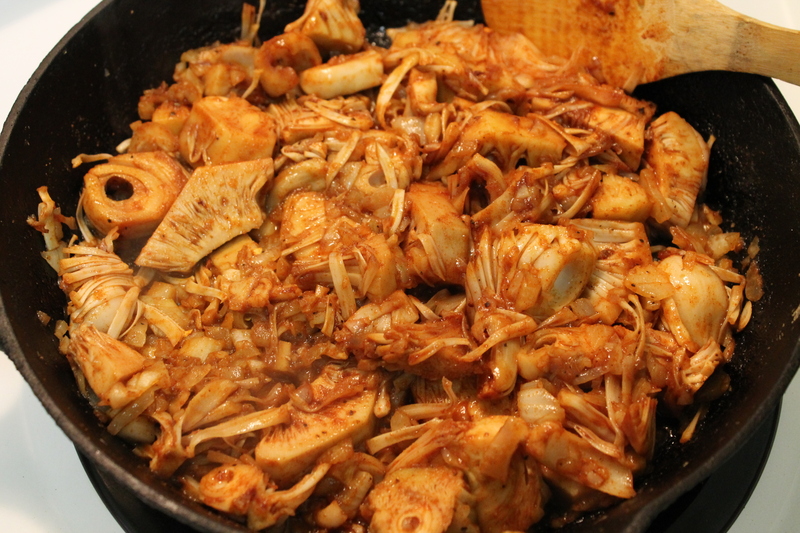 Once you have your Jackfruit prepared, toss it with the dry rub until all the pieces are coated. Allow to sit while you saute the onions. Mince your onion fairly fine, and drizzle some oil into a warm frying pan. You don’t want it to be too hot–low to medium. Add the onions and let them cook slowly for 10 minutes or so. 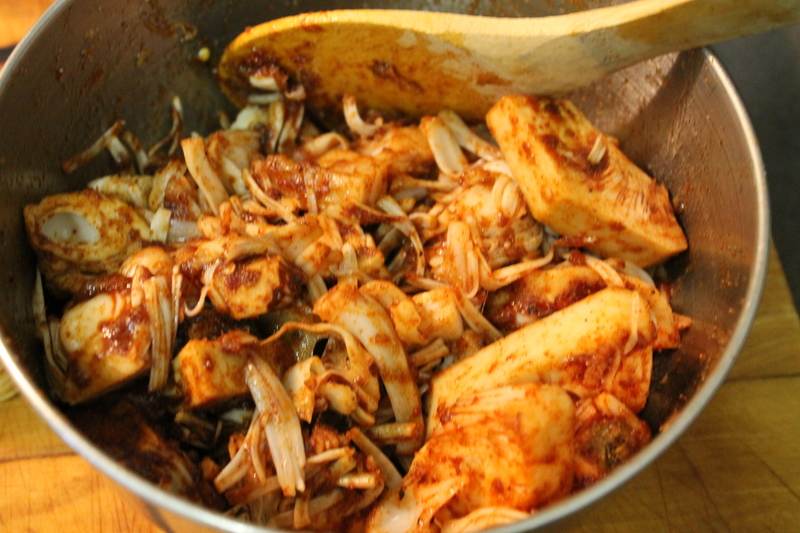 When they are soft and fragrant, add the garlic, and then the jackfruit. Allow to cook for another 10 minutes or so, stirring often, and adding water if the pan gets too dry. Remove from heat and set aside to cool for a few minutes. While it’s cooling, make the BBQ sauce. In a medium saucepan over medium heat, add a tablespoon of oil and then 1/3 c. onion, finely chopped, 3 cloves of garlic, finely chopped, 1/2 c ketchup, 1/3 c vinegar (cider vinegar if you have it, it’s slightly sweeter–although there is debate about whether or not it’s GF), 1/4 c brown sugar, 1 tbsp mustard or mustard powder, 1 tbsp Tamari, 2 tbsp blackstrap molasses, salt and pepper to taste. Allow this all to marry and bubble and come together and thicken. Now that the jackfruit has cooled a little, you can begin to “pull” it. Using two forks, begin to separate the strands, pulling them apart. 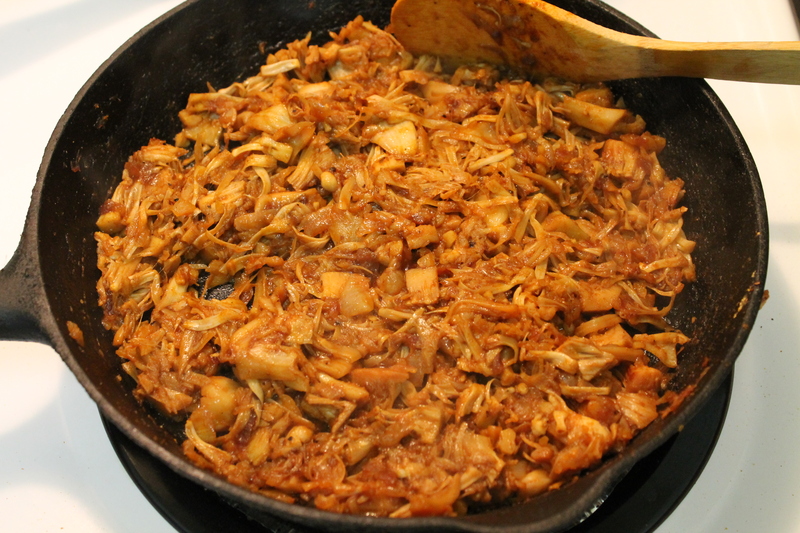 Once the Jackfruit is all “pulled,” put it back on the burner on low, and add a little BBQ sauce. Keep adding BBQ sauce, a little at a time, until you get it to the consistency you like. The remaining BBQ sauce put in a bottle to serve alongside. Warm the tortillas on a griddle individually, or wrap all 12 in a wet cloth napkin and put them inside a casserole dish (with the lid on) in a 200 degree oven for 10-15 minutes. For your slaw, you want to use a grater or a mandolin, and use green and purple cabbage, as well as carrots. Grate everything into a bowl, and then add a nice handful of chopped cilantro. For the dressing, in a mason jar, add 1 tbsp of tahini, 1 tbsp of sesame oil, and 2 tbsp of rice wine vinegar, along with maple syrup and salt and pepper to taste. Shake it up and toss the slaw with the dressing. 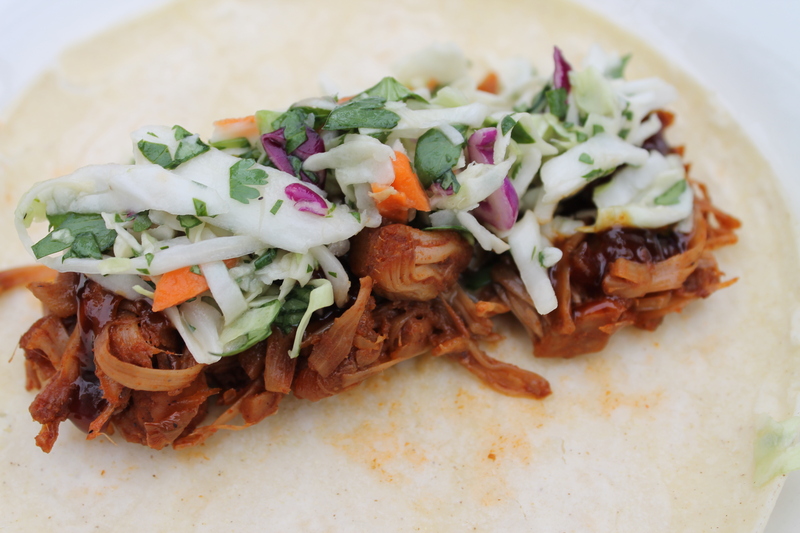 To assemble: place a warm tortilla on a plate, then top with the “pulled pork.” Next, top with your choice of slaw, and extra BBQ sauce and salsa, if desired. Roll and enjoy!